Say bye to evil under eye problems with the MAC Pro Conceal & Correct Palette. I've tried every under eye concealer under the sun. I couldn't find the right concealer until now. Yay! Although a bit pricey at $40, this is a professional palette of four concealer shades - NC40, NW40, NC42, NW43 - and two corrector shades in Rich Yellow and Burnt Coral so you definitely get your money's worth! Enriched with antioxidants and suited for all skin types, they can be used individually or combined to perfectly match any skin tone. In the video below I show you how I use this product to hid my darker under eye area. I apply a tiny amount of the burnt orange in the inner corner of my eye with a concealer brush. I blend the color evenly on my skin and then apply a combination of the yellow and lighter brown shades. The best way to do this is to experiment until you can find the right combination that fits with your skin. You can also use this palette to contour your face, highlight the under eye area, and conceal dark spots. Final thoughts: Overall I love this product! This is exactly what I need. I may not use this every day but when I want to look photo ready I am definitely going to use my new palette. 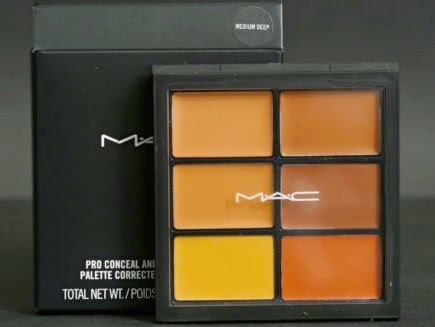 10 comments on "MAC PRO CONCEAL AND CORRECT PALETTE REVIEW & DEMO"
I Love MAC!! I need to get myself one of these!! I agree! I hate spending the money but usually I never regret it. This could NOT have come at a better time. I've noticed dark under eye circles (due to lack of quality sleep and stress). I am clueless when it comes to the right products so let me get thee to MAC. LOVE your vlog, such a beauty! Also, I can totally tell the difference between the eyes so I am sold! Thank you Kimmy! oooo I will check out the MUFE one. Nice tutorial. I have extra light skin and it's so so hard to get the dark circles to disappear (even with heavy concealer). I love what you did with this... I'm inspired to go look for some new products!